My emphasis — 200 million people at risk. We are always asked not to politicize such events. This request nakedly serves fossil fuel interests, who don’t want us to talk about what their profit-lust is doing to our world, to our communities, to our food supply. None of these Senators have a ranking higher that 14% from the League of Conservation Voters. (Hawley doesn’t have one yet, but you know where he’ll land.) None have advocated strong, immediate action on climate; most deny or dither on whether it’s even real or man-made. That’s an absolutely critical abdication of responsibility for their communities — though honestly, one has to put the blame on the voters themselves, who put these folks into office. Politics is not a business of courage: Elected officials generally do what is asked of them, or they get replaced. The voters of these states have chosen ideology over their own self-preservation; over their own physical safety and livelihoods. I can only attribute that to a media failure, which has put climate change as just another tribal political issue to fight over — and therefore to ignore as too lefty, too hippie, too polarizing — as opposed to a matter of mutual self-preservation. These states have state climatologists (thank you On Point and Meghna Chakrabarti for featuring one from Illinois this week) — who get ignored at the federal level, I’m guessing because of the influence of Fox News, the Koch brothers, et al. Now, this presents a political opportunity. That will sound crass, but politics is how we get things done, or not done. Very simply, very progressive Democrats will act on climate; Republicans and middling-Democrats will not. Our own Elizabeth Warren has been touring the country, going to places Democrats don’t usually go, and delivering policy-heavy speeches, connecting real policy plans to real lives. It is long past time for progressive Democrats to go on offense in the places left vulnerable by climate change, which is everywhere. 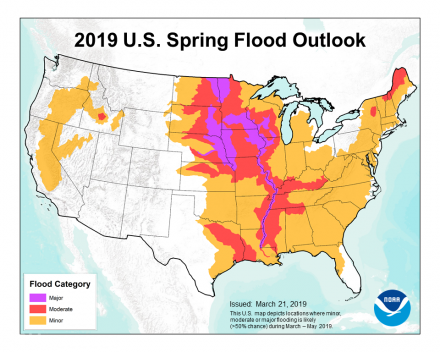 As NOAA predicts, two-thirds of the population of the United States will be vulnerable just this spring alone. Could this get political? Do you think? The Republicans turned their backs on their own constituents’ most basic needs of physical safety. They simply have to be replaced — or change their minds rather drastically. Someone’s got to go in and issue the challenge — why not Warren? Twenty children and six adults get gunned down in an elementary school by a man with a semi-automatic rifle, and America does nothing about it. Call me skeptical but I don’t see much action on the part of Americans if two thirds of them are vulnerable to bad weather, not as long as both major political parties are focused on markets, growth, entrepreneurs and the DOW. My one hope, as you point out, is Elizabeth Warren who is willing to take the fight to places that Democrats don’t usually go. Our party has been pulled so far to the right that to many voters, it’s just a coin flip on most issues. Our corporate media welcomes the falsehood that it is “liberal” and mainstream as it continues to push the corporate agenda, an agenda that continues to siphon our resources off and deliver them to the .01%. This is not a time for centrists, moderates, or those looking to appeal to these unicorn voters who exist in math, but not at the polls. This is a time for bold action and a willingness to speak the truth, even if it means the occasional embarrassing history of ones own party. Yes indeed, why not Warren? More seriously, I think we should consider tying emergency aid to a region’s support for climate change intervention. I don’t want a single penny of my taxes to go to these regions that have spent the past 20 years blocking ANY effort to stop climate change. I’m not sure I like the idea of punishing the people for the stupidity of their elected officials. Who else, besides these voters, would you hold responsible for such stupidity? Votes have consequences. There tens of millions of people who still assert lunacy such as climate change denial. I think they’re freeloaders. Furthermore, I think in a few short years or perhaps decades, they will be treated MUCH more harshly than I’m suggesting. We are seeing actual climate change catastrophe unfolding in real-time. The days of letting people off the hook are over. First, I’m not sure those most affected vote for them or vote on that basis if they do. Second, it seems vindictive to say we won’t help people affected by disaster because we don’t like their politics. It is not possible to vote for a GOP slate and not know that you are voting for climate change denial. These are voters that didn’t hesitate to limit home mortgage and property tax deductions — specifically aimed at middle-class households in Massachusetts, New York, and New Jersey. So I don’t care whether it’s vindictive or not. They’ve destroyed the climate and they haven’t hesitated to punish me for being “liberal” — I’m paying the bill for their irresponsibility. The time for gracious tolerance of intolerable behavior is long past. I would love to be able to agree with your first sentence above, but I’ve seen way too much evidence that voters are sometimes pretty clueless about what exactly they are getting when they vote for someone. I also don’t think those voters are the ones punishing any of us for being liberal. The Golden Rule (with variations in every faith tradition) says we should do unto others what we WOULD HAVE them do unto us, not do unto others what they ALREADY HAVE done to us. They are still our fellow humans and Americans. If they need help, we should offer it if we are able, no questions asked. You are letting responsible adults off the hook FAR too easily. These are the voters who love to hate “Liberal Democrats”. The idea of poking a finger in the eye and rubbing salt in the wounds of suffering families in the Northeast is why they love Donald Trump and still support him. If you want to go help them, do so. See if they accept your offer — I’ve met far too many of them, and I think they’ll spit in your face. I am not Jesus and this is not Jerusalem. Nope, no sale. I stand by my original criteria — when they elect ANYBODY who makes a reasonable effort to fight climate change, then I’ll start helping them out after they’re flooded as a consequence of their own darn greed, superstition, and ignorance. In the meantime, let whatever God they pray to (as in “hopes and prayers”) do His best. Perhaps he’ll get to them after tending to the people killed by mass murderers — because these same voters steadfastly oppose any sort of gun control AT ALL. Conservatives are morally and intellectually bankrupt. That’s it. Have a great day, y’all. It marks you clearly as a Liberal Democrat, spouting heresy and blasphemy to boot. These people live in a different world from you or me. They live in a world where “West Wing” was a liberal communist atheist lie, where climate change is a hoax, and where Donald Trump was sent by the God they worship to lead us out of the wilderness. They want us to rescue them, even as they spit in our face. I find myself re-watching that show a lot these past couple of years. Reminds me how a White House is supposed to operate! Someone said conservatives have a visceral urge to destroy what they don’t understand, but somehow sense is superior to them.